The Fellowship was fortunate enough to obtain a copy of EXILE ON THE PLANET OF THE APES #1 from BOOM! Studios. Corinna Bechko and Gabriel Hardman wrote the story with Marc Laming handling the art. This story arc takes place 18 years before the events of the original PLANET OF THE APES movie. Humans have been banished from Ape City by the order of Councilor Zaius. Scientist Dr. Prisca is brought before the council to be questioned about an incident the night before. A group of humans attacked the village of Capua and stole supplies. Something happened during the raid that leads the council to believe that Prisca is somehow responsible. Meanwhile, chimpanzee ex-con Timon raises suspicions about his activities. Corinna Bechko and Gabriel Hardman capture the political intrigue that was a part of the original franchise. I can definitely hear Maurice Evans’ voice when Zaius is talking. Marc Laming’s work is incredible and detailed. It reminds me a lot of the late Al Williamson’s work. If you like the classic PLANET OF THE APES movies, I would definitely recommend this book. It is interesting to get a further look into the ape society just prior to the 1968 movie. 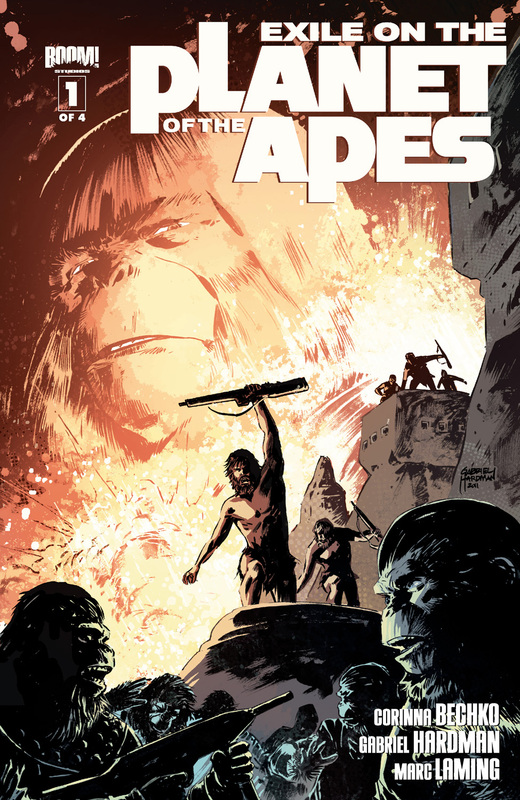 EXILE ON THE PLANET OF THE APES #1 is in comic book stores now or available at www.boom-studios.com.